For many of us ‘the predominant image of hospice is ... a landscaped, art-filled, home-like haven where the dying patient’s physical needs are all arranged by caring professionals, so that the family can concentrate on the emotional business of farewell.’ This image has its origins in the cornerstone edifice of the modern hospice movement worldwide, St. Christopher’s Hospice, founded by Dame Cicely Saunders and opened in Sydenham, England in 1967. It comes as a surprise then to arrive and encounter the modernist facade of St Christopher’s Hospice which speaks of its sixties origins and the then criteria for National Health Service funded buildings. The emergence in the 1960s of ‘patient centred medicine’, of which Dame Cicely was a pioneer, had not at that stage led on to the idea of ‘patient centred design’. Enter through the much newer entrance lobby and all is changed however. The Anniversary Centre has been designed to create a modern, social environment for St Christopher’s patients and their families and friends, with the aim of enabling access to services as easily as possible. Glass partitions open up the space enabling sight from reception to cafe to garden. Artworks created by users in a range of care and community contexts fill the walls from photographs to collages of painted landscapes. Nigel Hartley, Director of Supportive Care at St Christopher’s, writes that patients and carers are ‘both delighted and proud’ to show their work publicly; it feels ‘like a natural progression for everyone, having spent the time and energy creating the art, that it was then exhibited publicly. Such work has a clearly dynamic effect on the working environment within the Hospice. Librarian Denise Brady is my guide to St Christopher’s. She tells me how she came to work at the hospice and how she had gone from being one of the youngest employees to one of the most longstanding before sharing memories of Dame Cicely and her artist husband, Marian Bohusz-Szyszko, whose work I have come to see. 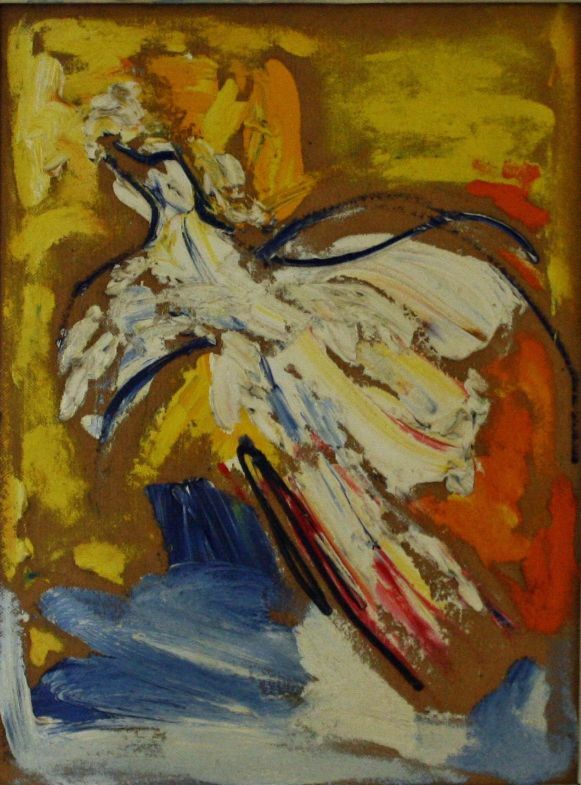 Dame Cicely, who had never previously bought a painting, felt an instant alignment with Bohusz’s paintings from her very first sight of a blue Crucifixion in a gallery window. She was driving past the Drian Gallery when she glimpsed the painting and feeling an immediate magnetic attraction parked the car and returned to the gallery just as it was about to close on the last day of the exhibition. Entranced by Bohusz’s work, she purchased an image of Christ Calming the Waters for the hospice because she thought the message of the picture was so fundamental to what she was going to try and do at St Christopher’s. The very next day she wrote to Bohusz explaining how she felt about his work and why she had bought this particular painting. Deeply moved, Bohusz offered to donate a painting for the Hospice Chapel and, after meeting, their romance began. Not only did their lives become entwined, culminating in their marriage in 1980, but the working lives of both became identified with St Christopher’s to the extent that both would eventually die at the Hospice. Most mornings the couple would arrive at St Christopher’s together before separating as Dame Cicely went to her office and Bohusz climbed the north stairs to his studio. Although his work can still be viewed in several locations throughout St Christopher’s, it is on the north stairs that many of his most significant works can be seen. 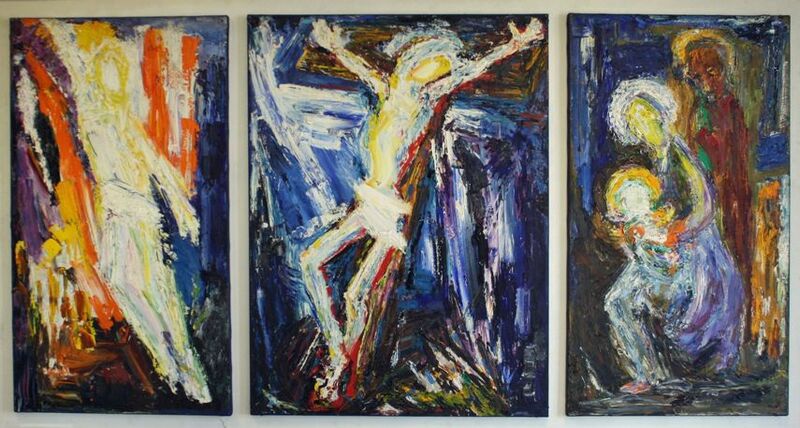 Here we find The Descent of the Spirit, The Resurrection and Triptych, paintings which through their expressive handling of paint and bold singing colours convey a transcendent vision. 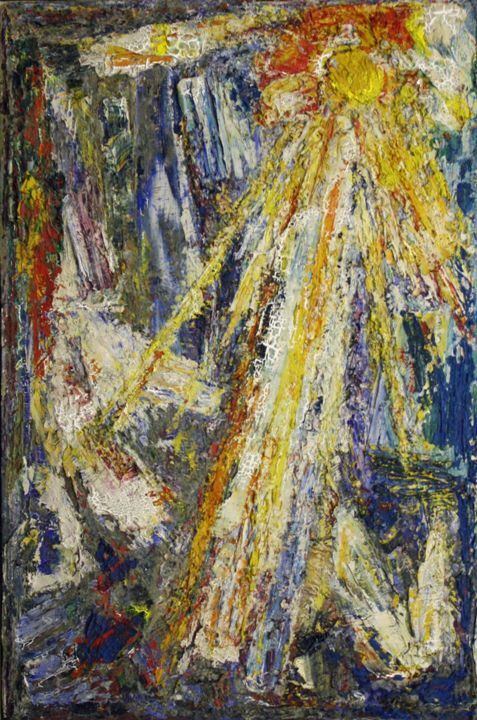 Bohusz searched for transcendence through a time consuming process of painting and over painting which enabled his figures to be illuminated from the paint structure itself rather than an external source of light. His devotional bounty of paint with its bold singing colours created a spiritually intense ecstatic vision that is all joy and hope even when painting death at the centre of Triptych. For Bohusz each Crucifixion foreshadows Resurrection. 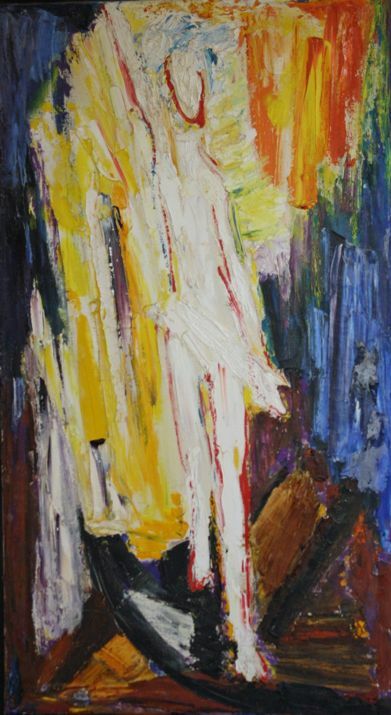 As Jan Wiktor Sienkiewicz has written his ‘Christ is always stretched on a leaning cross (along the diagonal line of the painting), hung in a whirling and heavy atmosphere of dark sapphire heaven, often with a bright “window” in the background.’ By these means Bohusz’s work moves toward a condition of grace. The Triptych originally hung in the Hospice’s chapel. Pam Rhodes wrote that Bohusz’s interpretations of the incarnation, crucifixion and resurrection in the Triptych ‘exude the pain, grief and hope which is mirrored so often in the emotions of those who come to pray here.’ Some, though, found the Triptych’s depiction of death too close to home for those who were coming to the Hospice to die and, when the Chapel became the multi-faith Pilgrim Room, the Triptych was moved to its current location. Today the number of Bohusz’s paintings displayed at St Christopher’s has been scaled back – partly to make space for the art of patients and carers – with works being seen primarily on the north stairwell, in the Dame Cicely Saunders Room and in the Education Centre. Among the paintings on display, in addition to Triptych (1967), are White Dove (1972), St Christopher (1970) and two portraits of Dame Cicely. Since his death Bohusz’s work has suffered a similar reduction in awareness. Bohusz’s identification of himself and his work with St Christopher’s may have had the effect of limiting what had originally been his international reputation having previously mounted one man exhibitions in Rome, Florence, Paris, Munich and Hamburg. His reputation deserves reassessment however. Not only was there the significant synergy of his work and vision with that of St Christopher’s but, as one of several exiled Polish artists utilising sacred themes, Bohusz also contributed to the revival in Church commissions in the UK which began through the work of George Bell and Walter Hussey and continues to the present day. In addition to being a visionary artist of sacred themes, he was also a significant figure for Polish artists in the UK. As principal of the Polish School of Art in London and as a driving force in the Association of Polish Artists in Great Britain, eventually being made Honorary Chairman for life, he supported many artists among the Polish community in London. 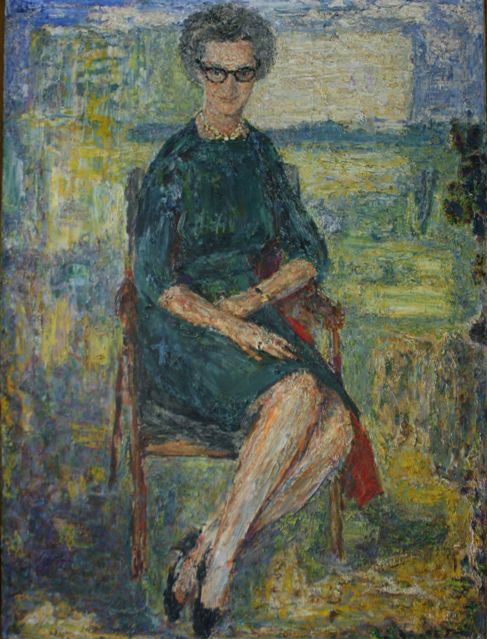 A former pupil, Halima Nalecz, founded the Drian Galleries which regularly hosted “a plethora of personalities from the artistic world of London, both English and Polish” and where Bohusz himself regularly exhibited. His is a story which deserves retelling, his work retains its power and vision and his contribution to the image and reality of hospices as landscaped, art-filled, home-like havens remains a significant contribution to have made not just to art but healthcare. For all these reasons a visit to view his work at St Christopher’s is deeply rewarding. The Creative Arts in Palliative Care, eds. N. Hartley & M. Payne, Jessica Kingsley Publishers, 2008. Wojchiech Falkowski: Painting, J.W. Sienkiewicz, Wydawnictwo UMCS, Lublin 2005. Living & Loved: A Celebration of Churches, P. Rhodes, Lion Hudson Plc, 2001. Marian Bohusz (M. Wykes-Joyce, Drian Gallery, 1977). The images are reproduced here with permission of St Christopher’s Hospice – Copyright; St Christopher’s Hospice.